I want to pressure myself to live up to it. I won't ever be the fat guy who people say "YOU did IRONMAN!?". If I'm not living up to it, I want to embarrass myself into doing better! Take that, future self. 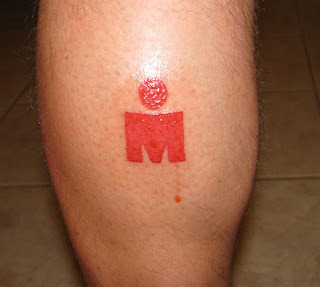 I'm not really a tattoo guy, so I went with the simple M-dot without any fanfare or flair. Nice - I finally got my drawing back and will be getting coloured on Sunday. I am super excited!